It’s impossible to scale your agency without white label services. This post shows what white label business opportunities you need & suggests the best partners. Agencies have to juggle different client demands, grow their business and ensure high-quality outcomes. It’s a must to automate and outsource anything that’s not part of your agency’s core competencies and to build partnerships with other agencies that can do what you can’t. This is a gold mine – if executed properly. What you should take into account when looking for white label services. How your clients can benefit from your agency using different white label business opportunities. And, what the best white label business opportunities are for your agency. Ready to Build Your White Label Service Network? You can outsource the most time-consuming tasks while focusing on the things you actually like doing. You get more business. If your agency can do “SEO” but can’t do “PPC”, your clients will look for this help somewhere else. And here’s the kicker – if another agency provides your client with great PPC service, chances are they will ask them to handle their SEO as well. White label business opportunities are often outsourced from places where labor costs are lower, thus enabling you to improve your margins. Now the next question is, how do you find good white label business opportunities? This is where we’ll give you the right tools to find a white label partner that you can trust. To find the right white label business partners, you must start with lead generation. Here all you need is Linkedin. Search for the service you are looking to outsource (1) and select the company that you think could do the job well (2). Once you select the company, you can click to see all of their employees (1). From there it’s pretty straight forward. You find the person who could be in charge of scouting for new businesses (1) and then you will need to install a Chrome extension called Hunter. An orange button (2) will then appear that will show the person’s email address. The rest is simple: Send your outreach mail and negotiate the deal you want. It’s nearly impossible to be 100% sure that an outsourced white label service partner is any good. There are very few, if any, sites where you can check for reviews of such companies. You can check Facebook reviews but more often than not, companies have disabled the review section. This, of course, is a red flag. If there are no, or very few reviews, you will have to get a bit more creative. It’s considered good practice to have your own “Dummy Project” – an e-shop that can be used to test whether a white label business service can do a good job. You can find a white label service’s current customers and ask for their input. That’s actually quite simple. You will need to head over to Linkody and take a few seconds to sign up. Once you add the domain (1), Linkody will crawl the Web and find all the mentions this site has. Occasionally, the mentions are reviews. Click through a few URLs and it should be rather obvious if the page where the marketing service is mentioned is also the site’s partner. Then try to schedule a quick chat to understand the strengths and weaknesses of the service you are thinking to outsource to. For easier call scheduling, you can use Youcanbook.me. You are looking to outsource some of your client work to a white label service. You work yourself to the bone to provide your clients with the best possible service. So now you have to trust another company to deliver the outstanding service you are known for providing. If the white label service provides great service, you take the credit. If the white label service delivers terrible service, you also have to take responsibility for that. There is no room for failure, so make sure your research is top-notch. The first thing you have to realize is that there’s no magic pill. This is a tough process based on analyzing your metrics, graphs and comparing NOW with BEFORE. Adding a white Label CRO Service to your agency’s offering would give you the ability to help your clients get a higher return on their acquisition spendings. The backbone of Conversion Rate Optimization is A/B testing. All the decisions are based on these tests. With Conversion Rate Optimization you can help your clients to find the right color & size for your Signup button, the best site copy & structure, and much more. The opportunities are unlimited. Always run one test at a time. Set hypothesizes. Eg. : “A signup form with 2 steps would increase the number of users by 20%”. For further reading view this Ultimate Guide by Neil’s Quick Sprout. OmniConvert – an agency based in Romania that offers a top-notch CRO service. MaxTraffic – they are famous for their exit-intent popups and push notifications. Definitely will make your visitors come back. Feel free to suggest any white label CRO services that you have had a great experience within the comment section. Using blog posts is one of the best lead generating strategies there is. Of course, only if it’s executed properly. If your goal is to get new customers organically, you should stop creating 300-800 word posts. And if you have a digital agency, the chances are that this was your main goal when you created the blog. Content creation is a time-consuming task. At least, it should be if you want your content to end up in Google’s top results. If you have a white label content creation service as part of your agency offering you can take this off your client’s hands. Moreover, if you undertake proper research, an outsourced content marketing service should improve your client’s lead generation efforts. At the end of the day, having a wide network of white label business opportunities to offer saves a lot of your client’s time. On-page optimization: Place the KWs in all the right places. Marketing & Link building: Generate buzz. You can also “steal” some short paragraphs from others, but you cannot just copy/past them. All the FREE membership sites do not create as high-quality content as WordAI does. To learn how to undertake keyword research and on-page optimization click here. For finding out how to get traffic to your blog, check this post. ProBlogger – on this site there’s a job board with hundreds of freelance writers. <your agency goes here> – if you have anything to suggest, the comment section is the place for that. There is a common misconception that “Content GOES Viral”. It couldn’t be further from the truth. Putting your content in front of as many people as possible is ridiculously important. If you could offer this kind of service to your clients – you would be God-like. Good content marketing agencies are hard to find because this involves building authority on numerous content promotion platforms across the web. And yes, that ain’t easy. So once you find a good white label content marketing agency, share with the rest of us. So once you find a good white label content marketing agency, share with the rest of us. Best content marketing agencies in 2017 can be found here. Your content strategy should not end after the post is published and shared on social media. Keyword volume changes over time, trends move on and your post continues to generate backlinks. This enables you to rank content for queries that are more competitive and with higher search volume as time goes by. Sounds like something you would also like to offer to your clients, right? It’s important to connect content creation with content optimization. In the best case, you would outsource to a white label service for this. Once you create a post you can add layers and optimize the post over time for queries with a higher search volume. Note: That’s ONE blog post that is optimized over time as the number of backlinks grows and it’s possible to rank for higher difficulty keywords. Your clients would enjoy more and more traffic coming to the same blog post. Moreover, thanks to link building, the site’s overall authority would also increase. For further reading, the ultimate guide to content optimization can be found here. V9SEO – These guys seem to have a very good understanding of the methodology behind this and the importance of this technique. <your agency goes here> – Want to have your agency included in here? Feel free to comment below and showcase your previous work. Did you know that if customers don’t receive a reply in 5 minutes, it almost doubles the chance that they will bounce? Once you outsource for a good white label customer support service it’s almost certain that there always will be someone ready to take care of your customer’s needs. This is rather obvious. If your customer’s customers are happy, Lifetime Value increases and Retention Rate grows. If SAAS business struggles with churn or an e-commerce store has a high bounce rate, then this is a situation where white label customer support service will come in handy. Tagove – the chat box in the lower right corner that gives the opportunity to chat and make a video call to resolve issues immediately. Teltel – this is a VOIP service that sets up a hotline that can be reached no matter where you’re located. The best white label service to provide customer support will be one that offer’s a combination of quality and price. A list of Digital Agencies that can help with customer support, depending on the region, can be found here. I remember the days when SEO Audit prices started at 10k €. Now, there are software tools that can put together white label SEO Audit report in a matter of minutes. The way people see the page is completely different from how search engines view it. Thus, showing your client the actual picture – from the eyes of a search engine is very important. First of all, a list of keywords is useless if there is no use for it. Don’t be that agency who gives a list of queries for the client without a clear use for it. To optimize the company’s main pages. To include keywords in the articles when producing content for the blog. Well written site’s copy that addresses the need of your customers and is Search Engine Optimized – offers a huge advantage. Make them prepare the site’s copy, meta tags & etc., so your client only needs to copy paste the text on the site. Keyword optimization timeline from focus keyword to focus keyword. You offer your client with actionable tips that they can use straight away. Backlinks are still the most important ranking factor. So there you go. Link building is king. Link building is the “art” of getting your website mentioned on other sites. There is no magic to this and in the long run, it pays off if your white label link building partner is not trying to beat or cheat “the system”. Google finds out everything and the last thing your client will love is a Google penalty. Make sure that you communicate to your client that this is a long-term investment. Results come only with time but once the organic traffic starts flowing, it will stick around long after link building efforts are over. If you outsource this part of your client offering, it’s crucial that you monitor the progress (see – SEO Data Monitoring). For further reading: To see the best link building strategies out there, check this 42 white hat backlink techniques article. Link Building is extremely time consuming but once there are systems in place it can be automated to a certain degree. When picking a white label SEO link building agency, you have to be extremely careful and make review checking a priority. Because if it’s done wrong, you can get your client’s site penalized. Sharp Rocket – White Label Link Building Agency located in the Philippines and recommended by Brian Dean himself. AdFicient – The top agency. Once you start working on a clients’ SEO or find a white label SEO service, the data monitoring should be done consistently. There is no need to outsource this as there are a lot of great tools that can automate this process. By monitoring SEO data you can decrease the odds that your client’s site will be penalized. Besides backlink monitoring, Linkody is a white label seo tool that sends you and to your clients customized PDF email reports. Once you signup or login to your Linkody account. 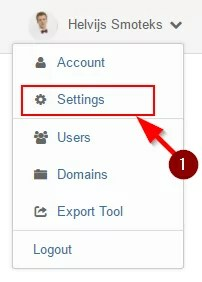 You can activate & customize these reports by clicking on your name in the upper right corner and selecting “Settings” (1). First, you will land in the email notifications (1) section. There you can customize the reports you receive about lost & new backlinks, as well as the competitor’s links (2). You can also adjust the frequency at which these reports are sent (3) and to which email address they are delivered (4). When that’s done, click “Save changes” (5) and the report automation is done. In the PDF report section (1) you can customize the reports you or your clients receive. 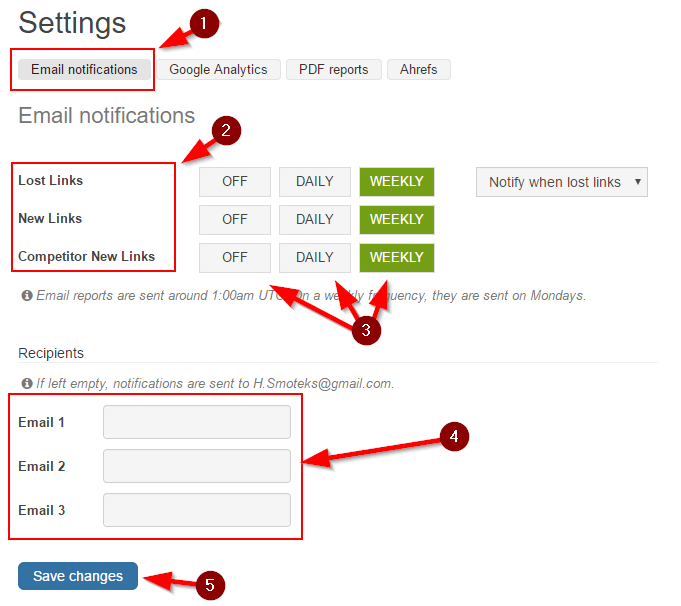 Add your logo (2), select the metrics you want to reports on (3) and Linkody will keep the reports flowing (4). That’s it. To manage white label SEO reporting automation all you need is one white label seo tool – Linkody. Many reports show that people will leave a page if it takes longer than 4 seconds to load. Yes, you have 4 seconds and if the page fails to load your traffic will bounce. An obvious sign of a site’s slow loading time is its Bounce Rate. If it’s over 60% you should look into page speed optimization. The obvious reason for carrying out Site Speed Optimization is that it will decrease the percentage of people who leave your page without performing any action. To know if a client needs Website Speed Optimization it’s important that you know how to track a site’s speed. Google Chrome’s Console (ctrl+shift+J) shows the site’s loading speed once you click on the Network and press F5. Cons – The console shows YOUR loading speed. The speed is fixed to your current location and internet connection. It’s also possible to track the website’s speed using Google Analytics. Once you are in GA, head over to the Behavior section (1) & click on Site speed -> Overview (2). In this section, you can see the site’s average speed across all locations, browsers (3), countries (4) and pages (5). Gift of Speed – Their page loads under 4 seconds – they know what they’re doing. It’s inevitable that your clients will ask for software related tweaks & tasks. Having a white label software development service partner is a must. Fixing Technical SEO issues is not possible without good software developers. Mobile trends must be accommodated. Growth hacking can get very technical. This is rarely something you want to handle yourself. The best advice would be to get the best developer network that covers the most important skill-sets. If you know a good white label software development service, feel free to make the suggestions in the comment section. With the rise of AI, social media channels are getting easier and easier to automate. So maintaining a client’s social media platforms might take only several minutes a day if systems are in place. Creating new content, making several posts a day, making sure a community grows and engaging with the content – all this together can be time-consuming. Helping your clients to save time on these tasks makes a lot of sense. With Instagress & MassPlanner shot down it’s hard to say how this will affect Social Media Automation. It sure doesn’t look that good. MeetEdgar – Social Media post automation at its finest. ViralTag – It’s like Buffer but allows to make some posts “Evergreen” and publish them over & over again. Note: Their App is super heavy. To learn more you can watch this free social media online video course. The best Social Media Management Agencies charge a large amount of money but also offer an incredible service. Thus, think twice about whether your client can afford the service. Social Vantage, Acodez, and LYFE Marketing – the best in the field. UpWork and Fiverr – a great solution if your client is on the budget. Make sure you consider only people with 4.9-star reviews and above. With nearly 2 billion people on facebook as of late 2017, it’s nearly impossible to ignore the potential of the world’s largest social network. Not taking into account the opportunities Facebook’s paid ads offer, this social media platform is a great tool for guerrilla marketing. Moreover, other company social network management can make you a good $$$. So finding a white label facebook marketing partner is very important when it comes to expanding your agency’s offering. EZ Marketing – EZMarketing has a whole team of expert writers, graphic designers, and skilled social media consultants. Mainstreet Host – “Put Mainstreethost to work for you”. Google AdWords supported by Analytics offers one of the most advanced paid advertising opportunities. Having this service in your arsenal will come in handy, so having a White Label PPC service is a must. Outsource it or hire – either way, it’s a must. Google has created a system of tools that function well together and can be linked to provide your customers with a marketing funnel that automates customer acquisition. Google is everywhere. People are interacting and engaging with their websites every day. Thus, this is one of the best adoptions for getting in front of your target audience. To learn more watch this complete AdWords video course. Even if you have basic knowledge of how AdWords function, creating a marketing funnel from scratch and developing remarketing ads is a time-consuming process. Especially if you want to optimize the ads and spend the lowest possible amount of money. Directive and Ignite Visibility – the top-dogs of AdWords management. UpWork and Fiverr – here you can find freelancers for any budget. The average internet user spends 50 minutes each day on Facebook. We lose more than 1 day (24 hours) each month just on Facebook. Even it this might sound sad, for marketers, this is a gold mine. Just imagine all the attention you can get from your target audience. A white label Facebook Ad manager suddenly sounds much more appealing, right? People spend so much time on this platform, that brands can target them directly with different psychological triggers. This simply creates an irresistible need for products and services. Facebook creates a problem and shows that your client has a solution. To learn more check Neil’s complete Facebook Ad course. If your customer has a good product or service, the Return on Investment that a great agency can generate is almost always worth the price. Voy Media and AdvertiseMint are two of the best white label facebook ad agencies. Getting a freelancer is also an option. Note: If you choose to work with a little-known white label business opportunity partners, it’s a good idea to make a commission deal with small fixed payment. Emails are still one of the most powerful communication and business tools out there. As soon as a person reaches working age email becomes part of their life. So targeting someone during working hours is an extremely good way to sell, generate leads and get new customers. Moreover, in 2018 the average Email Open Rate was 24.79% and the Click Through Rate 4.19%. That means with every 100 emails you send 4 people will be so interested in what you are offering that they will click through to your landing page. For your customers, that’s definitely a white label service they would benefit from. To learn more, view this free online email marketing video course from HubSpot and here’s a cool tool to never let your leads go cold. It’s important to note that there are some areas of email marketing that should not be outsourced. It’s better to keep private email lists private, as it’s your community. Indie Mark – 20 years of experience as a white label email marketing partner. FulcrumTech – Your ROI is their mission. Getting your story across using the fewest possible words and communicating the benefits of your service in an easy-to-understand manner takes time. Moreover, it is far from easy without extensive experience. Therefore, it is important to have a white label service for this job. Colorful site copy can increase conversion rates and lead people to your desired marketing funnel action much faster. The only difference between good and bad site copy is the Conversion Rate – and if you don’t have the numbers, there is no way of proving that it’s excellent or not up to standard. Even a 1% improvement or +1 sale on every 100 visits can lead to a significant gain in your client’s user base. Thus, it might be worth investing time in finding a white label copy writing service that does a good job. For more information, check these Copy Writing do’s and don’ts. Market Smiths – they build robust partnerships. The Hired Pens – copy writers with expertise in just about any industry. Lead generation is one of those tasks that sales people dread. Getting in touch or talking with people you don’t know is kind of scary. Finding the lead segment that your clients need, qualifying these leads and handing over ready to buy prospects would take a lot of hustle off the hands of your agency’s customers. Some agencies claim that this is the era of Linkedin Lead Generation. I am a strong believer that there is nothing better than picking up the phone and calling. Calling is often all you need to reach the decision maker. If dialing is an activity that scares your clients, this is definitely a partnership you want to have in your white label business opportunity network. The best white label lead generation agencies will gladly agree on a longer-term partnership that’s on a commission basis, paying per customer. eGentic and Iron Paper – top white label lead generation agencies. If you know of any white label services that have delivered outstanding lead generation service, please let us all know in the comments section – sharing is caring. The most valuable lead magnets are case studies, testimonials and whitepapers. This will get the contracts signed. You let the client know that you know what you are doing. Infogram and Visme – Free tools to make all the charts one might need. & here you can find whitepaper marketing examples. I would suggest using only Visme because it is very simple to use and it’s not very expensive either. Often, your clients will ask for recommendations and it is great to be able to provide the service they are looking for. Especially if it’s somewhat related to what you are offering. Having a wide network of partnerships in the agency business is a must. If you don’t want to take our word for that, well, a while ago we surveyed 8 of the most successful agency owners just for you. Here‘s their secret sauce to success. Moreover, feel free to use our comment section to suggest white label business opportunities that have delivered outstanding services for your agency. Note: The agencies suggested above are only recommendations and in different industries, the service quality offered may differ. Great article! Some other white label options would be for website conversion tools. For example at BounceHelp we provide white label solutions for phone lead auto-callback apps, as well as integrated call tracking. Our agency’s love being able to look like heroes delivering more phone leads using their branding on their own clients website apps. Hey Helvis, Thanks for sharing this blog. I am working for a similar white label PPC agency and fully agree with all the types of White Label Services to get more business online as listed above in this blog post. Ive been looking to enhance our company with additional services, but not be overloaded with so many man hours. Great job, do you know any white label companies that offer partnership service to agencies in Brazil? Great list of suppliers, thanks for sharing – with the number of online marketing strategies available online it makes much more sense than trying to learn it all yourself! Thanks for sharing these SEO strategies for business agencies, your blog’s content is very informative to business marketers. Thank you. I’m setting up a white label service myself so this was very helpful. Thanks, Helvis Smoteks for sharing, A majority of the marketing companies that lack expertise in PPC or any other form of digital marketing are opting for white label services.